How much do you think the trade show revenue in the United States is? If you answered A, B, or C, then, you’ve got some trade show fact-checking to do! That’s because in 2016, this sector made a whopping $12.81 billion! That means whoever said “print is dead” made a mistake. After all, these huge marketing events rely heavily on print advertisement tools and supplies. This doesn’t mean you have to spend thousands and thousands to attend one. There’s plenty of trade show booth ideas for small budgets that will make you rule the floor! And that’s what we’re here to share with you today. So, if you’re at loss of trade show display ideas or you’re worried that your tight marketing budget won’t cut it, keep reading! Spending on Trade Shows: Is It Worth It? The simple answer? Most definitely. But of course, we know that you want to know what exactly makes trade shows a must-have tool in your marketing arsenal. These are only some of the numbers showcasing the value of trade shows. But as you can see, they’re considerable, which is why you shouldn’t discount their importance to your brand. 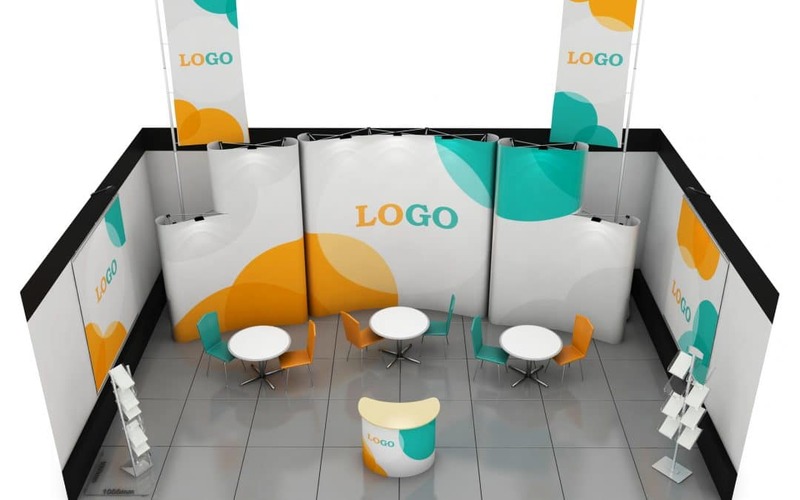 Besides, these seven creative trade show booth ideas we’ll share with you will help you rise and stand out from the rest. Without having to go over and beyond your marketing budget. Banner stands are easily some of the most affordable trade show must-haves. Make no mistake though. They may be easy on the wallet, but they still deliver brand visibility with their eye-catching graphics and useful consumer information display. Combine these portable displays with hanging banners, and you’ll get the attention of attendees from far away. To top it all off, you can reuse these for your next event! Thanks to their portability, you need only to disassemble them and set them up again anywhere. How’s that for cost-affordability? Product samples are a key ingredient to a successful trade show event. How so? For starters, they give you the opportunity to share the good news about your products and/or services. They let you tell your target market – through a visual, tangible, and first-hand experience – how your brand’s offers stack up to the competition. There are only a few other tactics that can make your potential customers crave more of your brand than free product samples. Since they only give a “sampling” of what to come, they only whet the appetite (which also makes them low cost!). It’s thanks to this that consumers end up wanting more of what they had. Just make sure your product samples give your target attendees a sneak peek of even better things to come. Like product samples, promotional merchandise or giveaways offer trade show goers a preview of what your brand is all about. They may be small and low-cost, but they pack a punch when it comes to branding effectiveness. To start off, they show you care about your customers. Those who’ll receive giveaways from you will consider it a sign of goodwill, and this alone can already make them remember your brand. If you’ve never heard of the Law of Reciprocity, then know that giveaways are the perfect example. It’s human nature to “reciprocate” kind gestures. So, when people receive something free from you, like branded drinkware, writing implements, or bags, they’ll feel more inclined to do business with you. Even if they don’t during the trade show, the fact itself that you left them with a (free) branded item will give them something to remember you with. When the time comes they need something your business offers, they’ll most likely think of you first before checking out the competition. Remember, attendees aren’t just looking to buy – they’re also in it for a pleasurable experience. So, why not turn your trade show booth into a world of fun by setting up a game station? We’re not talking about an all-out, complete-with-a-surround-sound-system gaming area. We’re talking about old-school, arcade-like games! Think Pacman, Pinball, colored blocks, or if your trade booth area permits, mini-golf or shooting range. For the branding part, give the winners prizes with your brand name on them. Of course, you’d also want to give consolation prizes. But hey, that’s even more branding and visibility for your business. Pro tip: Make sure your games, or at least your prizes, remain in line with your brand. For example, if your brand falls under the sports sector, then branded drinking tumblers are a way to go. We’re talking both in literal and figurative terms! Think about it. How do you think trade show attendees will react to a plant-filled booth in the middle of a technology-filled auditorium or stadium? They most likely will want to check out that small oasis! To make your booth even more inviting and welcoming, consider a set up that incorporates eco-friendly materials. And what’s better than a used trade show booth? Not only is it a form of recycling; it’s also a good way to save on your event budget! In a nation where 95% of the population owns a smartphone, it’s safe to assume that everyone wants to remain connected. So, why not give them what they want and need during the trade show? Attendees won’t be the only ones to benefit from your free Wi-Fi. It can also lead to your brand getting shout outs online, from those people grateful for the connectivity. If your budget allows for it, consider giving away free coffee and snacks. Serve them in (green) containers that boast of your brand name. Share them with those who take the time to check out your booth. Free food won’t only get more people to visit your spot. It’ll also act as another form of “goodwill” to them, which makes you even more recognizable and recall-worthy. You don’t have to spend tens of thousands of dollars to make your brand stand out during these events. So long as you follow these trade show booth ideas for small budgets, you can stay within budget while still ensuring you capture the attention of your target market. So, why not let us help you become a rockstar in the next trade show you’ll participate in? Connect with us now and we’ll help you have that one-of-a-kind set up that displays the uniqueness of your brand!